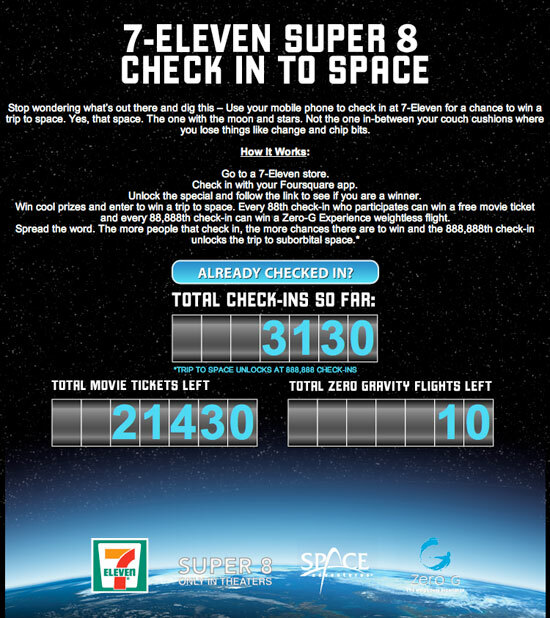 Check In at 7-Eleven For a Chance to go to Space! Along with selling Rocket Poppeteers stuff at 7-Eleven, you can also win a chance to go to space along with free movie tickets and other prizes. All you have to do is go to a local 7-Eleven store and "check in" using your mobile phone and the Foursquare application. Every 88th check-in wins a movie ticket, every 88,888 wins a zero-gravity flight, and the 888,888th checkin wins a sub-orbital flight into space! This is a pretty cool promo, so load up the app and head on over to your local 7-11 for a chance to win!